This squad will take home the $100,000 first-place prize. 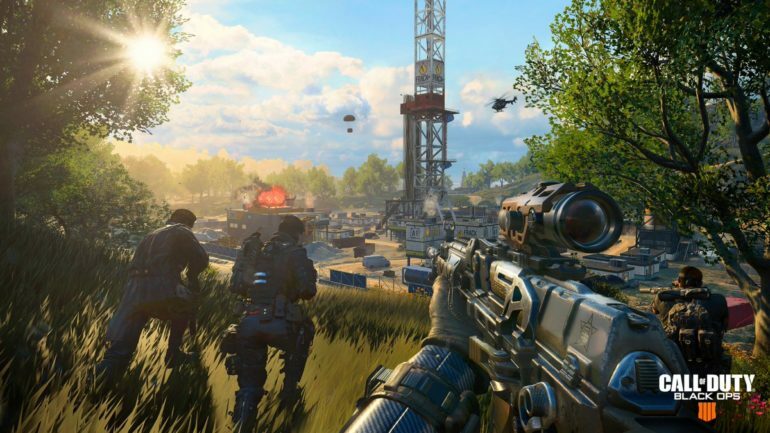 The first official tournament for Call of Duty: Black Ops 4’s new battle royale mode just came to an end—and a former professional CS:GO player took home the title. Michael “Shroud” Grzesiek’s squad emerged victorious in the Doritos Bowl Blackout tournament at TwitchCon today in San Jose, California, securing the $100,000 first-place prize. Shroud was just one of the popular team captains for the Doritos Bowl, alongside other high-profile streamers like Tyler “Ninja” Blevins, Jack “CouRage” Dunlop, and Ben “DrLupo” Lupo. The Doritos Bowl scoring format awarded one point per kill, as well as bonus multipliers depending on the squad’s final placing in each game. A top 10 finish earned a 0.5 times multiplier. A 0.75 times bonus multiplier was awarded for a top five placing, while team’s that finished in the top three gained a 1.25 times multiplier. These teams played four hour-long heats in which they tried to play (and win) as many Blackout games as possible to rack up large point totals. Shroud, Justin “Just9n” Ortiz, Jake “ChocoTaco” Throop, and Chad Goff scored just under 500 points to take home first place at the Doritos Bowl. CouRage’s superstar lineup featuring Call of Duty world champions Damon “Karma” Barlow and Tyler “TeePee” Polchow, as well as former Halo professional Jacob “Hysteria” Reiser, came in second with 431.25 points. 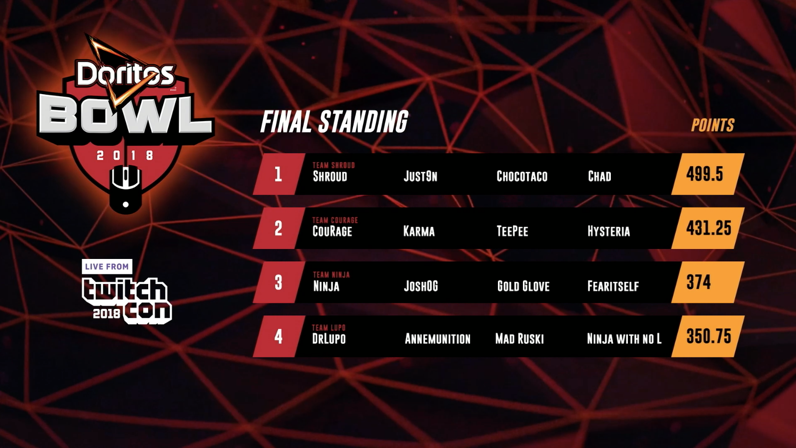 All of these players put on a fantastic show in the Doritos Bowl, exhibiting the potential that Blackout could have as an esports mode. Fans of traditional Call of Duty esports, however, will look forward to the start of the Black Ops 4 season on Dec. 7 with the first major LAN event, CWL Las Vegas.